This article first appeared in Unlisted, The Edge Malaysia Weekly, on August 10, 2015 - August 30, 2015. 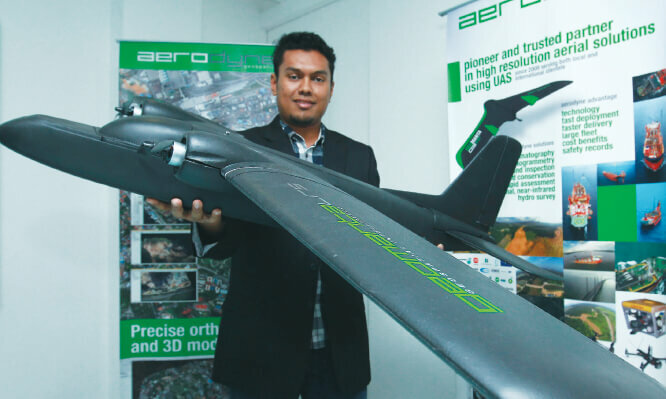 Aerodyne Geospatial Sdn Bhd’s drone business was born out of a need to find a real solution to a pressing problem. With some ingenuity, the company has expanded its range of aerial-based solutions to include services like 2D and 3D mapping, precision agriculture, inspection and surveillance as well as project monitoring. Drones, or unmanned aerial vehicles, were previously the province of the military or geeky hobbyists. One man, however, has gone further than anyone else in Malaysia to find new uses for such technology and turn his obsession into a viable business. Kamarul Muhamed, founder of Aerodyne Geospatial Sdn Bhd, does not believe in confining definitions. In the company’s few years of existence, he has managed to propel it into public consciousness by using his drones to provide invaluable assistance in the recent devastating floods in Kelantan and Terengganu as well as helping property developers or project managers scope out a piece of land. “Drones are essentially flying robots. When we combine robotics and aviation, you see things from a fresh perspective, do things faster and collect data on a very large scale automatically and systematically,” he says. The irony is that Kamarul is not an engineer. He is a chartered accountant who has had an interest in aviation for a long time. The only thing he has ever done that remotely resembled his present business was run an international software company. In 2009, Kamarul was given an opportunity to shoot a documentary and this required aerial shots of Egypt, Turkey and Russia. He was faced with the choice of either hiring a helicopter at US$10,000 an hour or using drones, which were relatively new technology at the time. Drones would be more economical and would allow him to mobilise more quickly and easily. They also eliminated the need for weeks of planning and logistics. In short, the business was born out of the need to find a real solution to a pressing problem, he says. Today, drones can be used for more than just aerial cinematography and emergency response. Aerodyne uses drones to offer a variety of services, including 2D and 3D mapping, precision agriculture, inspection and surveillance, and project monitoring. Although Kamarul and his team have been using drones to provide such services since 2009, it was only this year that Aerodyne was formally incorporated into a company. Business grew modestly by word of mouth. But when he introduced a service that used drones for project reporting and monitoring, the business really took off. It took just one customer to buy into the concept for word to get around. One client after another signed up for the service. The company even managed to secure an overseas client in the first half of this year. Kamarul must be doing something right. Despite drones being notoriously expensive, Aerodyne has enough earnings to buy them in cash. The company has also managed to pay its own way thus far without the need for additional investors. The drones are sourced from all over the world, including Switzerland, Canada and China. And sometimes, the team develops and builds its own drones. Aerodyne occasionally takes an aggressive marketing approach, Kamarul admits. Once, he even offered a potential client a two-month trial. It paid off. The customer saw the advantage of using Aerodyne’s services and signed a five-year contract with the company. “We know our strengths, which is that we have good guys who are young, committed and energetic,” says Kamarul. Also, the company has something unique to offer its clients and provide them with real value. Why did he diversify from aerial cinematography, which would have been considered the bread and butter of any other drone company? Because the potential is limited and the business is not sustainable, says Kamarul. By introducing new services, he has been able to create a pipeline for Aerodyne’s services. “Offering real business solutions is the only way to go. Now, a large chunk of our business comes from long-term or multi-year contracts for services other than aerial cinematography work,” he says. By shifting its focus to other aerial-based solutions, Aerodyne was able to expand its horizons. After all, the company already has what it takes — the people with the right expertise, particularly drone pilots. Today, the team is made up of a diverse group of individuals, including engineers, editors, photographers, architects and project managers. Now, Kamarul just needs to find new applications for their respective skillsets. He realises that one immediate service it can offer is to help construction and engineering companies in project management and reporting. Aerodyne uses different types of drones for different kinds of work. There is no one perfect drone that can meet all mission requirements, Kamarul says. It is always a trade-off between cost, risk factors, endurance, range, payload, reliability, control systems and visual systems. “[That’s why] we have a potpourri of drones for different kinds of mission requirements,” he says. For the company’s geospatial intelligence work, it uses fully autonomous drones that can fly for more than four hours and cover a range of 50km. The team is looking to tweak this drone so that it can fly for more than 10 hours. When it comes to forestry and precision agriculture, the team uses multispectral cameras to enhance remote-sensing capabilities. A multispectral image is one that captures image data at specific frequencies across the electromagnetic spectrum. Prices of these drones can start from RM5,000 and even go beyond seven digits for professional commercial drones. While there are many things to consider before acquiring one, Kamarul says sourcing for drones is not difficult. At the end of last year, when our country was hit by a devastating flood, Aerodyne went in to help. Kamarul says his team took a risk in making this decision. He sent out his team to the hardest hit areas — and at its own cost. Initially, it was supposed to be a collaboration with Telekom Malaysia Bhd (TM). However, it took time for the telecommunications company to get approval. So, Kamarul decided to go in under Aerodyne and started capturing images of the devastation. Despite being involved in a number of projects, Kamarul appealed to his clients and explained the reasons for taking Aerodyne’s resources away. For him, the flood was a calamity of unprecedented proportions. It was big and he wanted to focus on it. Also, he has a soft spot for Kelantan because it is his home state. “We had three teams spending three weeks at various locations offering our help to just about anyone who needed what we could offer — precise information on the flood,” he says. The response was tremendous. The footage that the team captured was shared on social media for public viewing. It was even shared with government agencies and the mainstream media at no cost. For Aerodyne, it was all about assisting in the emergency response efforts. The payback was that the company’s work was recognised and it was propelled into the limelight. It received support from the Department of Civil Aviation (DCA) and Department of Survey and Mapping Malaysia. Aerodyne’s partner, TM, stepped in to provide communications infrastructure and logistical support. It should be pointed out that Aerodyne didn’t go in unprepared. The team had been developing emergency response drones since early last year because it had foreseen the need for them in the event of natural disasters. “People think that Malaysia does not have an aerial support system for our emergency response. Those who respond to emergencies usually arrive at ground zero without a clue of what is going on. They spend a lot of time just trying to make sense of what is happening,” Kamarul says. This is one area Aerodyne can contribute significantly, he says. When it comes to emergency response, it is crucial for drones to be able to fly in inclement weather. So, the company bought off-the-shelf drones and modified them heavily to make them waterproof. It already had a few prototypes of these waterproof drones. At the same time, the company started collaborating with TM, the custodian of Malaysia Emergency Response (MERS999) on this project. The idea was to provide aerial services to help in 999 situations. Apart from dispatching just the fire brigade, police or ambulance, Aerodyne’s drones can also be dispatched. The team can offer value in terms of bringing visuals of the situation to the emergency responders so that they can act in a more effective manner. The benefit of such a system is information. “Once you have information, you can make the right decisions. Previously, people had to make decisions [in floods] based on guesswork. Now, they will know what the water level is at any point. And post-flood, we can even aid in the investigation of the cause of the flood,” Kamarul says. The massive floods in the north of Malaysia late last year helped Aerodyne to test its systems. Training is important for drone pilots. Kamarul says Aerodyne’s pilots undergo continuous training. Also, as a drone operator, it needs to abide by the DCA’s requirements. During an operation, there needs to be a drone commander, or the person-in-charge on site who is responsible for safety. In other words, this person acts as the manager overseeing the pilot who flies the drone. Basically, this is to ensure that the safety requirements and those of the relevant authorities are met. Training is important because the company must entrust the pilot with a very expensive device, which in some cases can cost millions of ringgit. As this is a relatively new industry in Malaysia, the requirements are not that comprehensive yet. There are some basic ones though. Most of these, however, apply to drones that are over 20kg. For those below 20kg, the requirements are limited — they cannot be flown within 5km of an aerodrome or more than 400ft high. “There are rules, but they are flouted all the time, which is dangerous. Added to that is the fact that no insurance company will insure a drone operation in Malaysia. This makes it a risky business proposition,” Kamarul points out. While companies can easily acquire drones, operating them is another matter, he adds. Often, these companies end up crashing their drones simply because they do not have trained pilots to operate them. Aerodyne has had several discussions with the DCA on this matter. As an industry player, it recognises the importance of safety and following regulations. Kamarul says the company has suggested having a simple certification for drone pilots, much like a driving licence. “If we do that, we inject some need for accountability into the industry. If you have a licence, and if you flout the law, you will lose your licence,” he says. This will increase the level of competency in general and awareness of flying the drones responsibly. Of late, there have been news reports about people misusing drones for all manner of things. Aerodyne has decided to help increase professionalism in the industry by starting the first flying school sometime this year in collaboration with TM and Multimedia University (MMU). For the company itself, the qualification of the pilot is defined by the number of hours he or she has spent flying drones. Those who have flown less than 100 hours are considered a junior pilot. Kamarul has had more than 1,000 hours of flying time. “Everybody has to pass through the threshold of 100 hours before they can be called a senior pilot. Each flight is about 15 minutes. Working backwards, can you imagine how many days you need to fly to reach 100 hours? Kamarul is proud to say that when it comes to flying drones, Aerodyne has a good track record. Since 2009, the team has had only one incident and that too, a minor one where they lost a drone at sea. He cannot disclose too much as it is still in the works, but says that Aerodyne plans to offer a suite of cloud-based solutions to the market in photogrammetry processing and geographic information systems. R&D is crucial, he says. Aerodyne is committed to reinvesting a chunk of its revenue in R&D and wants to work closely with local universities on this. “Drones are just the tool. It all boils down to creativity, domain expertise and focus. From emergency response to search and rescue to project monitoring and surveillance to policing or civil defence to natural resources and environmental monitoring, the list is endless,” Kamarul says.